Dell Swarm – Swarm, Share & Save! saw this in my mailbox after lunch and i’m pleasantly surprised that something cool like this is being implemented here first in Singapore! what a brilliant way of using social media. 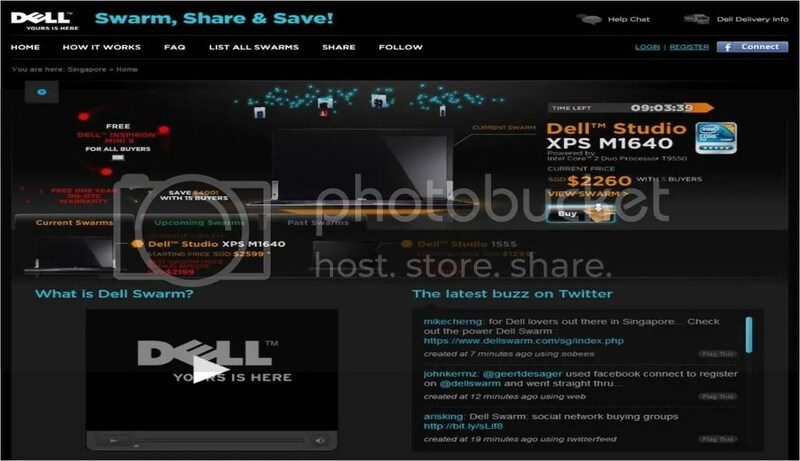 Singapore – Dell is using Singapore as the world’s first market to trial out the new Dell Swarm – an online group which leverages on social networks and allows customers to buy laptops at discount prices. When customers visit dellswarm.com/sg/index.php, they can select a laptop they’d like to purchase which gets the Swarm under way. As more people join the Swarm, the more the price of the laptop drops. The Swarm ends when it reaches the maximum number of 15 buyers or a time limit of 72 hours. The site has links to Twitter and Facebook where users can share their swarms and attract more people to the group – ultimately driving the price of the laptop down. The Dell Swarm is currently a pilot project in Singapore and is only open to Singapore residents. According to Francis Huan, corporate communications manager for Dell Singapore, the concept has received outstanding feedback since launching two weeks ago. “We wanted to introduce a new way for customers to buy stuff and at the same time obviously to save money,” Huan said. Huan says Singapore was chosen as the market to launch the pilot project because of the demographics.